When we think about reflections in water, we usually think of calm lakes and trees on the shore opposite to us. Or clouds. Or at least that’s what I think of: Everything is so far away, that it seems to be reflected at an axis that is a horizontal line far away from us. 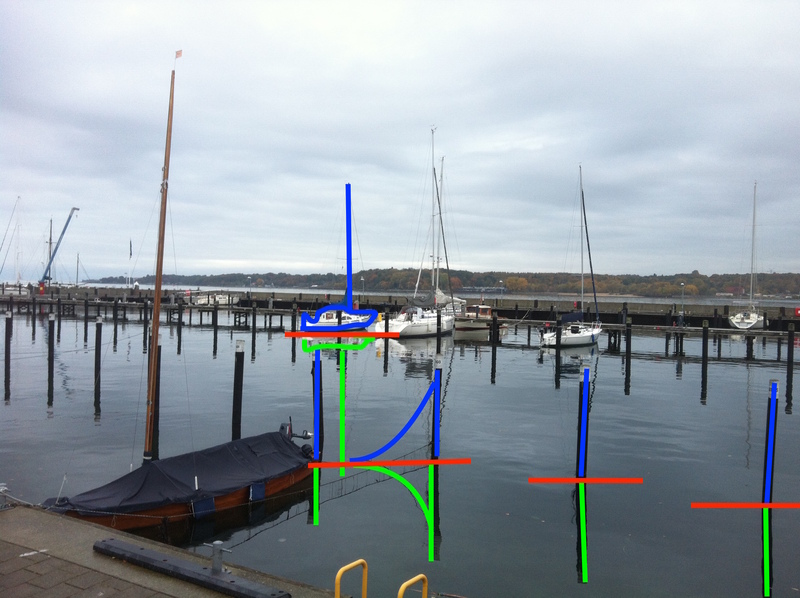 Then the other day I walked along Kiel Fjord and it hit me that I had never actually consciously observed reflection of things that are located close to my position, and especially things who are not pretty much equidistant to me, but where one end is a lot closer than another one. Consider the picture below: Do you notice something that looks kinda odd to you (while at the same time looking super familiar)? And then I’m pretty sure that once we’ve drawn something that we have constructed ourselves from what we knew (rather than just copied a drawing from the blackboard or a book, although I think that also helps a lot), we are a lot less likely to forget it again. Anyway, this is a type of exercise I will use — and recommend — a lot more in the future! This entry was posted in method, observation and tagged Kiel fjord, method, optics, reflection, teaching on November 15, 2016 by mglessmer. This is a method that I have been excited about ever since learning about #birdclass in the “Evidence-based undergraduate STEM teaching” MOOC last year: Help students discover that the content of your class is not restricted to your class, but actually occurs everywhere! All the time! In their own lives! The idea is that students take pictures or describe their observations related to course materials in short messages, which are posted somewhere so every participant of the class can see them. One example where I would use this: Hydraulic jumps. As I said on Tuesday, hydraulic jumps are often taught in a way that students have a hard time realizing that they can actually observe them all the time. Most students have observed the phenomenon, maybe even consciously, yet are not able to put it together with the theory they hear about during their lectures. 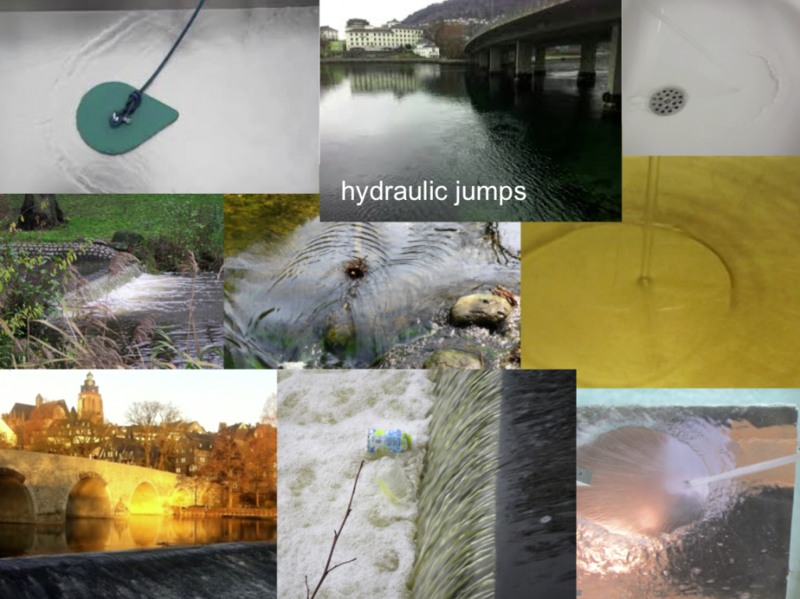 So why not, in your class on hydrodynamics, ask students to send in pictures of all the hydraulic jumps they happen to see in their everyday life? The collection that soon builds will likely look something like the image below: Lots of sinks, some shots of people hosing their decks or cars, lots of rivers. But does it matter if students send in the 15th picture of a sink? No, because they still looked at the sink, recognized that what they saw was a hydraulic jump, and took a picture. Even if all of this only takes 30 seconds, that’s probably 30 extra seconds a student thought about your content, that otherwise he or she would have only thought about doing their dishes or cleaning their deck or their car. A collection of images, all showing hydraulic jumps of some kind. And even if you do this with hydraulic jumps, and not with Taylor columns or whatever comes next in your class, once students start looking at the world through the kind of glasses that let them spot the hydraulic jumps, they are also going to look at waves on a puddle and tell you whether those are shallow water or deep water waves, and they are going to see refraction of waves around pylons. In short: They have learned to actually observe the kind of content you care about in class, but in their own world. The “classic” method uses twitter to share pictures and observations, which apparently works very well. And of course you can either make it voluntary or compulsory to send in pictures, or give bonus points, and specify what kind and quality of text should come with the picture. You, as the instructor, can also use the pictures in class as examples. Actually, I would recommend picking one or two occasionally and discussing for a minute or two why they are great examples and what is interesting about them. You can do this as introduction to that day’s topic or as a random anecdote to engage students. But acknowledging the students’ pictures and expanding on their thoughts is really useful to keep them engaged in the topic and make them excited to submit more and better pictures (hence to find better examples in their lives, which means to think more about your course’s topic!). And you don’t even have to use twitter. Whatever learning management system you might be using might work, too, and there are many other platforms. I recently gave a workshop for instructors at TU Dresden and talked about how awesome it would be if they made their students take pictures of everything related to their class. They were (legitimately!) a bit reluctant at first, because you cannot actually see the topic of the course, measuring and automation technology (MAT), just the fridge or camera or whatever gadget that uses MAT. But still, going about your everyday life thinking about which of the technical instruments around you might be using MAT, and discovering that most of them do, is pretty awesome, isn’t it? And documenting those thoughts might already be a step towards thinking more about MAT. At least that is what I claimed, and it seems to have worked out pretty well. Have you tried something similar? How did it work out? This entry was posted in method and tagged active learning, facebook, hydraulic jump, method, TU Dresden, twitter on December 3, 2015 by mglessmer. Sometimes we really want our students to practice presenting posters, but we can’t afford printing all those nice A0-posters for everybody in our large class, or we don’t want them spending time on design but focus on content, or both. What then? Well, instead of having them design A0 posters, just give them a template for 6 A4 (or letter, if you are in the US) pages (or 9, if you want more categories than I did in the example below), let them fill those with content, print them, and then either tape or pin them to a wall. Instant poster session! You could of course also hand them the sheets of paper that already contain the heading, or give them blank papers and let them write the titles themselves. As long as you are not interested in the design-part of creating a poster, this is a really cheap and easy way! 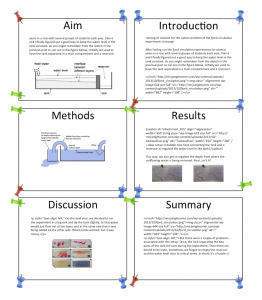 This entry was posted in method and tagged method, poster presentation on November 20, 2015 by mglessmer. I’m very excited to announce that I, together with Christian Seifert, have been awarded a Tandem Fellowship by the Stifterverband für die Deutsche Wissenschaft. Christian, among other things, teaches undergraduate mathematics for engineers, and together we have developed a concept to improve instruction, which we now get support to implement. The problem that we are addressing is that mathematics is taught to 1300 students from 12 different engineering study programs at once. At the moment, in addition to lectures and practice sessions in both very large and small groups, students get weekly online exercises that they can earn bonus points with. Student feedback is positive – they appreciate the opportunity to practice, they like that they are nudged towards continuously working on whatever is currently going on in class, and obviously they like to earn bonus points they can use on the exam. However, mathematics is not typically a subject that non-mathematicians are very keen on. Many feel like there is no relevance of the content to their lives or even their studies. And many don’t feel confident they have a chance to succeed. As I wrote in my recent posts on motivation, both believing that you can succeed and seeing the relevance of things you are supposed to be studying to your life are necessary for people to feel intrinsically motivated. So this is where we want to start. Since the experience with the weekly online tests is so positive, we want to develop exercises that apply the mathematics they are currently learning to topics from their own, chosen fields. So if they are supposed to practice solving a set of linear equations, students of mechanical engineering, for example, might as well use one from a mechanical engineering case. Or even better: they might be asked to develop this set of equations first, and then solve it. By connecting mathematics with topics students are really interested in, we hope to get them to engage more with matematics. More engagement will then likely mean that they improve their understanding both of mathmatics itself and – equally important – of their main subjects, where currently manystudents lack the math skills required. At the same time, we hope this will increase student motivation for both subjects. Of course, there is still a lot of work to be done to first implement this concept and then evaluate whether it is working as well as we thought it would, and then probably modifying it and evaluating some more. But I am excited to get started! This entry was posted in Uncategorized and tagged e-assessment, mathematics, mechanical engineering, mechanics, method, online learning, teaching, WIN! on November 16, 2015 by mglessmer. How do you deal with grading to make it less painful? Last semester student numbers in the course I taught went back to less than 1/3rd of the previous year’s numbers. And yet – grading was a huge pain. So I’ve been thinking about strategies that make grading bearable. The main thing that helps me is to make very explicit rubrics when I design the exam, long before I start grading. I think about what is the minimum requirement for each answer, and what is the level that I would expect for a B. How important are the different answers relative to each other (and hence how many points should they contribute to the final score). But then when it comes to grading, this is what I do. I lock myself in to avoid colleagues coming to talk to me and distract me (if at all possible – this year it was not). I disconnect from the internet to avoid distraction. I make sure I have enough water to drink very close by. I go through all the same questions in all the exams before moving on to the next question and looking at that one on all the exams. This helps to make sure grading stays consistent between students. I also look at a couple of exams before I write down the first grades, it usually takes an adjustment period. I remind myself of how far the students have come during the course. Sometimes I look back at very early assignments if I need a reminder of where they started from. I move around. Seriously, grading standing (or at least getting up repeatedly and walking and stretching) really helps. I look back at early papers I wrote as a student. That really helps putting things into perspective. I keep mental lists of the most ridiculous answers for my own entertainment (but would obviously not share them, no matter how tempting that might be). What do you think? And ideas? Comments? Suggestions? Please share! This entry was posted in method and tagged grading, method on January 21, 2015 by mglessmer. An example of one topic at different levels of difficulty. Designing exercises at just the right level of difficulty is a pretty difficult task. On the one hand, we would like students to do a lot of thinking themselves, and sometimes even choose the methods they use to solve the questions. On the other hand, we often want them to choose the right methods, and we want to give them enough guidance to be able to actually come to a good answer in the end. For a project I am currently involved in, I recently drew up a sketch of how a specific task could be solved at different levels of difficulty. The topic this exercise is on “spotting the key variables using Shainin’s variables search design”, and my sketch is based on Antony’s (1999) paper. In a nutshell, the idea is that paper helicopters (maple-seed style, see image below) have many variables that influence their flight time (for example wing length, body width, number of paper clips on them, …) and a specific method (“Shainin’s variables search design”) is used to determine which variables are the most important ones. 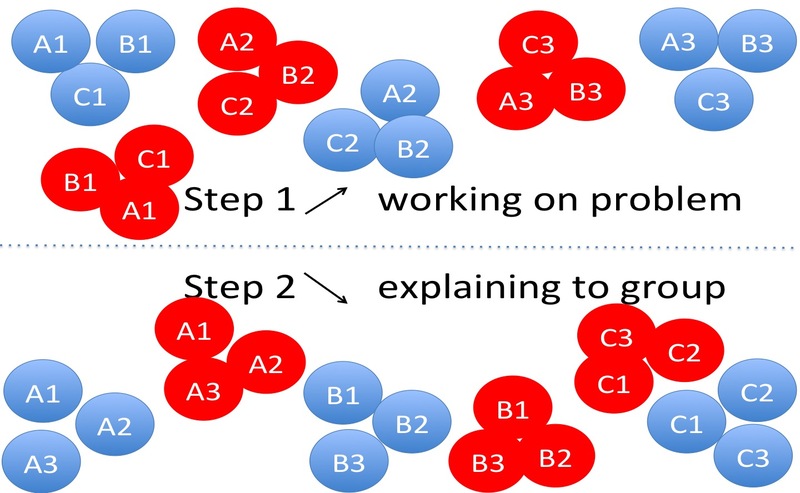 In the image below, you’ll find the original steps from the Antony (1999) paper in the left column. In the second column, these steps are recreated in a very closely-guided exercise. 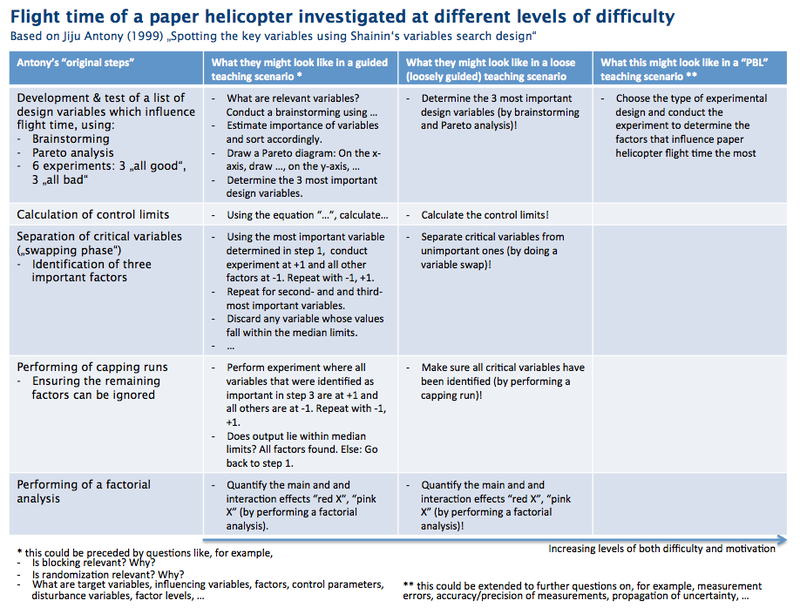 In the third column, the teaching scenario becomes less strict, (and even less strict if you omit the part in the brackets), and in the right column the whole task is designed as a problem-based scenario. Clearly, difficulty increases from left to right. 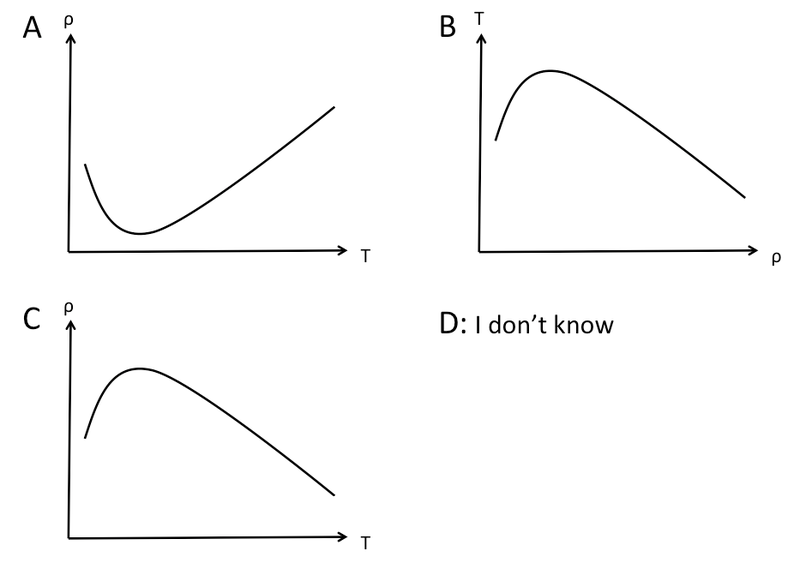 Typically, though, motivation of students tasked with similar exercises also increases from left to right. So which of these scenarios should we choose, and why? Of course, there is not one clear answer. It depends on the learning outcomes (classified, for example, by Bloom or in the SOLO framework) you have decided on for your course. If you choose one of the options further to the left, you are providing a good structure for students to work in. It is very clear what steps they are to take in which order, and what answer is expected of them. They will know whether they are fulfilling your expectations at all times. The further towards the right you choose your approach, the more is expected from the students. Now they will need to decide themselves which methods to use, what steps to take, whether what they have done is enough to answer the question conclusively. Having the freedom to choose things is motivating for students, however only as long as the task is still solvable. You might need to provide more guidance occasionally or point out different ways they could take to come to the next step. 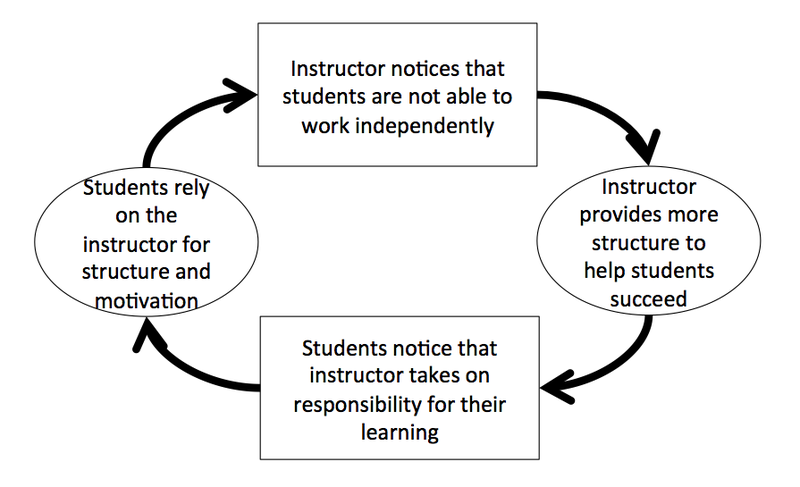 The reason I am writing this post is that I often see a disconnect between the standards instructors claim to have and the kind of exercises they let their students do*. If one of your learning outcomes is that students be able to select appropriate methods to solve a problem, then choosing the leftmost option is not giving your students the chance to develop that skill, because you are making all the choices for them. 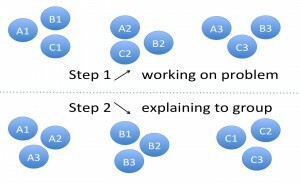 You could, of course, still include questions at each junction, firstly pointing out that there IS a junction (which might not be obvious to students who might be following the instructions cook-book style), and secondly asking for alternative choices to the one you made when designing the exercise, or for arguments for/against that choice. But what I see is that instructors have students do exercises similarly to the one in the left column, probably even have them write exams in that style, yet expect them to be able to write master’s theses where they are to choose methods themselves. This post is my attempt to explain why that probably won’t work. This entry was posted in other and tagged DoE, method, Shainin variables search design on January 14, 2015 by mglessmer. Examples of different kinds of multiple choice questions that you could use. Multiple choice questions are a tool that is used a lot with clickers or even on exams, but they are especially on my mind these days because I’ve been exposed to them on the student side for the first time in a very long time. I’m taking the “Introduction to evidence-based STEM teaching” course on coursera, and taking the tests there, I noticed how I fall into the typical student behavior: working backwards from the given answers, rather than actually thinking about how I would answer the question first, and then looking at the possible answers. And it is amazing how high you can score just by looking at which answer contains certain key words, or whether the grammatical structure of the answers matches the question… Scary! So now I’m thinking again about how to ask good multiple choice questions. This post is heavily inspired by a book chapter that I read a while ago in preparation for a teaching innovation: “Teaching with Classroom Response Systems – creating active learning environments” by Derek Bruff (2009). While you should really go and read the book, I will talk you through his “taxonomy of clicker questions” (chapter 3 of said book), using my own random oceanography examples. I’m focusing here on content questions in contrast to process questions (which would deal with the learning process itself, i.e. who the students are, how they feel about things, how well they think they understand, …). Content questions can be asked at different levels of difficulty, and also for different purposes. In the most basic case, content questions are about recall of facts on a basic level. Which ocean has the largest surface area? Recall questions are more useful for assessing learning than for engaging students in discussions. But they can also be very helpful at the beginning of class periods or new topics to help students activate prior knowledge, which will then help them connect new concepts to already existing concepts, thereby supporting deep learning. They can also help an instructor understand students’ previous knowledge in order to assess what kind of foundation can be built on with future instruction. Answering conceptual understanding questions requires higher-level cognitive functions than purely recalling facts. Now, in addition to recalling, students need to understand concepts. Useful “wrong” answers are typically based on student misconceptions. Offering typical student misconceptions as possible answers is a way to elicit a misconception, so it can be confronted and resolved in a next step. 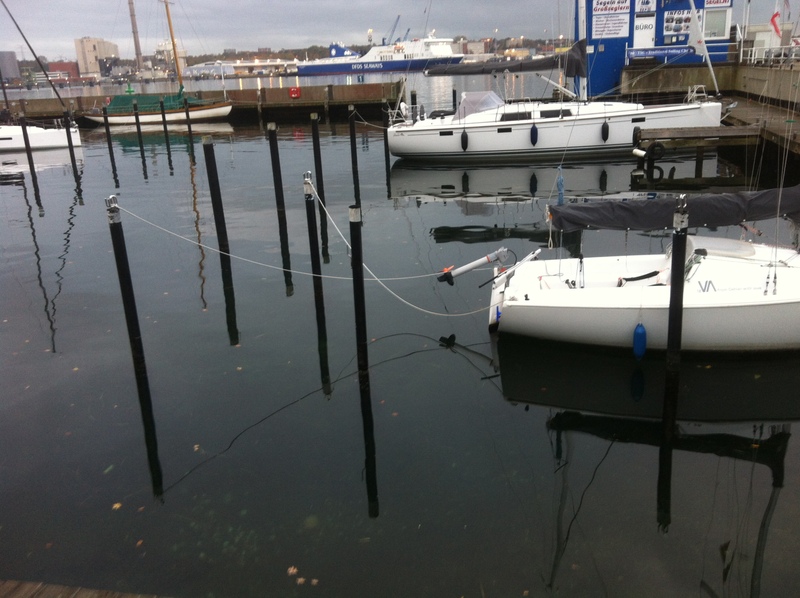 At a water depth of 2 meters, which of the following statements is correct? A: A wave with a wavelength of 10 m is faster than one with 20 m.
B: A wave with a wavelength of 10 m is slower than one with 20 m.
C: A wave with a wavelength of 10 m is as fast as one with 20 m.
It is important to ask yourself whether a question actually is a conceptual understanding question or whether it could, in fact, be answered correctly purely based on good listening or reading. Is a correct answer really an indication of a good grasp of the underlying concept? Classification questions assess understanding of concepts by having students decide which answer choices fall into a given category. Which of the following are examples of freak waves? A: The 2004 Indian Ocean Boxing Day tsunami. B: A wave with a wave height of more than twice the significant wave height. C: A wave with a wave height of more than five times the significant wave height. D: The highest third of waves. Which of the following is a characteristic of a freak wave? This type of questions is useful when students will have to use given definitions, because they practice to see whether or not a classification (and hence a method or approach) is applicable to a given situation. In the “explanation of concepts” type of question, students have to weigh different definitions of a given phenomenon and find the one that describes it best. Which of the following best describes the significant wave height? Instead of offering your own answer choices here, you could also ask students to explain a concept in their own words and then, in a next step, have them vote on which of those is the best explanation. These questions test the understanding of a concept without, at the same time, testing computational skills. If the same question was asked giving numbers for the weights and distances, students might calculate the correct answer without actually having understood the concepts behind it. If you wanted to create salt fingers that formed as quickly as possible and lasted for as long as possible, how would you set up the experiment? A: Using temperature and salt. B: Using temperature and sugar. C: Using salt and sugar. Ratio reasoning questions let you test the understanding of a concept without testing maths skills, too. A: approximately twice as far from the mounting as she does. B: approximately at the same distance from the mounting as she does. C: approximately half as far from the mounting as she does. If the concept is understood, students can answer this without having been given numbers to calculate and then decide. 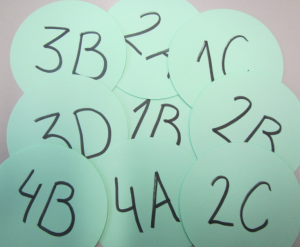 Which of the following sketches best describes the density maximum in freshwater? 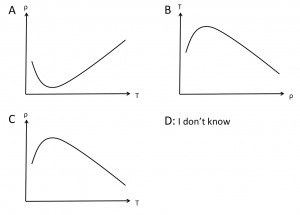 If students have a firm grasp of the concept, they will be able to pick which of the graphs represents a given concept. If they are not sure what is shown on which axis, you can be pretty sure they do not understand the concept yet. Application questions further integrative learning, where students bring together ideas from multiple sessions or courses. 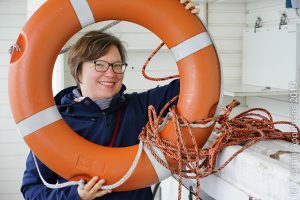 Which has the biggest effect on sea surface temperature? A: Heating through radiation from the sun. C: Mixing with other water masses. D: Radiation to space during night time. Students here have the chance to discuss the effect sizes depending on multiple factors, like for example the geographical setting, the season, or others. Here students apply a procedure to come to the correct answer. The phase velocity of a shallow water wave is 7 m/s. How deep is the water? Have students predict something to force them to commit to once choice so they are more invested in the outcome of an experiment (or even explanation) later on. Which will melt faster, an ice cube in fresh water or in salt water? A: The one in fresh water. B: The one in salt water. Will the radius of a ball launched on a rotating table increase or decrease as the speed of the rotation is increased? D: Depends on the speed the ball is launched with. Critical thinking questions do not necessarily have one right answer. Instead, they provide opportunities for discussion by suggesting several valid answers. 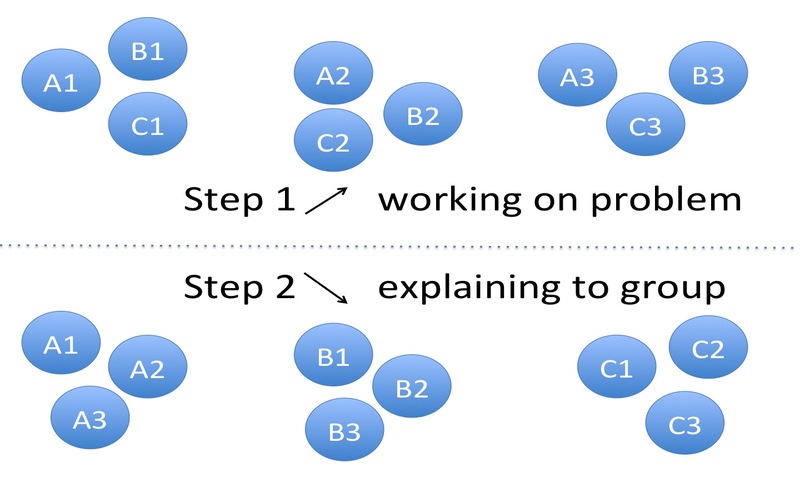 For critical thinking questions, the discussion step (which is always recommended!) is even more important, because now it isn’t about finding a correct answer, but about developing valid reasoning and about practicing discussion skills. I. because the wave is slowed down by friction with the bottom. II. because transformation between kinetic and potential energy is taking place. III. because the period stays constant. Of course, in the example above you wouldn’t have to offer all possible combinations as options, but you can pick as many as you like! Choose one best answer out of several possible answers that all have their merits. In this case, there is no one correct answer, since the sampling strategy depends on the question you are investigating. But discussing different situations and which of the strategies above might be useful for what situation is a great exercise. And for those of you who are interested in even more multiple choice question examples, check out the post on multiple choice questions at different Bloom levels. * while you would probably not want to offer this option in a graded assessment, in a classroom setting that is about formative assessment or feedback, remember to include this option! Giving that option avoids wild guessing and gives you a clearer feedback on whether or not students know (or think they know) the answer. This entry was posted in literature and tagged clickers, method, multiple-choice questions, voting cards on November 26, 2014 by mglessmer. Getting feedback on what was least clear in a course session. A classroom assessment technique that I like a lot is “the muddiest point”. It is very simple: At the end of a course unit, you hand out small pieces of papers and ask students to write down the single most confusing point (or the three least clear points, or whatever you chose). You then collect the notes and go through them in preparation for the next class. This technique can also be combined with classical minute papers, for example, or with asking students to write down the take-home message they are taking away from that teaching unit. It is nice though if take-home messages actually remain with the students to literally take home, rather than being collected by the instructor. But give it a try – sometimes it is really surprising to see what students take home from a lesson: It might not be what you thought was the main message! Often they find anecdotes much more telling than all the other important things you thought you had conveyed so beautifully. And then the muddiest points are also really helpful to make sure you focus your energy on topics that students really need help with. This entry was posted in method and tagged CAT, method, muddiest point on November 17, 2014 by mglessmer. 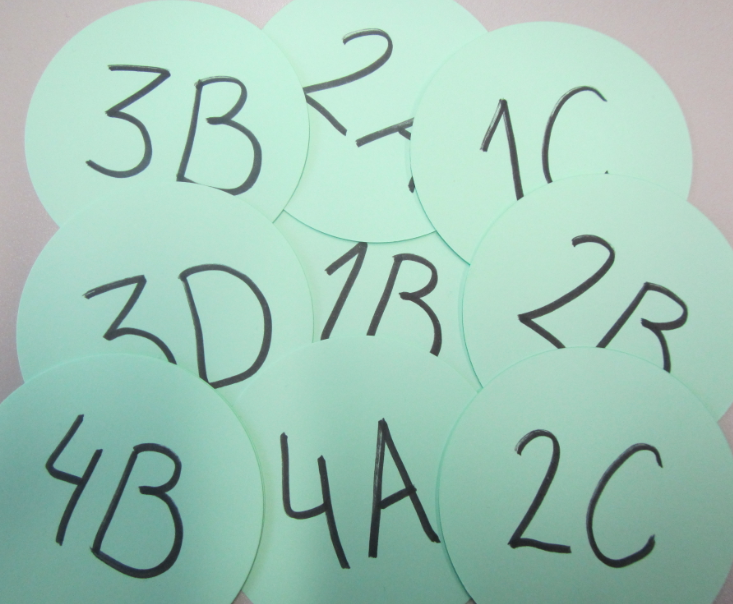 A method to get all students engaged in solving problem sets. The jigsaw method (in German often called the “expert” method), you split your class into small groups. For the sake of clarity let’s assume for now that there are 9 students in your class; this would give you three groups with three students each. Each of your groups now get their own problem to work on. After a certain amount of time, the groups are mixed: In each of the new groups, you will have one member of each of the old groups. In these new groups, every student tells the other two about the problem she has been working on in her previous group and hopefully explains it well enough that in the end, everybody knows how to solve all of the problems. you, the instructor, get to cover more problem sets this way than if you were to do all of them in sequence with the whole group. And what do I do if I have more than 9 students? This is a method that needs a little practice. And switching seats to get all students in the right groups takes time, as does working well together in groups. But it is definitely worth the initial friction once people have gotten used to it! 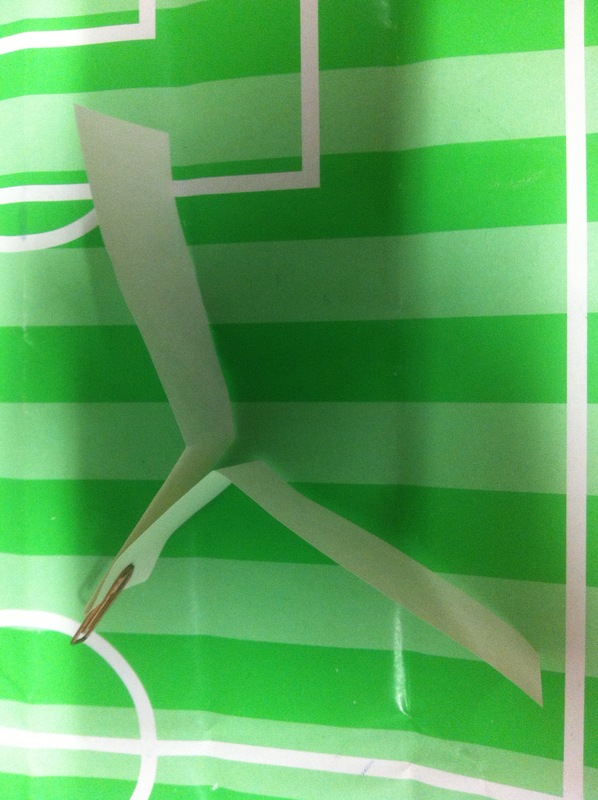 This entry was posted in method and tagged groupwork, jigsaw, method on November 10, 2014 by mglessmer.